Kayserburg is a collection of both upright and grand pianos which represents a new commitment to the classic heritage and excellence. Pearl River Piano Group commissioned international master piano designer Lothar Thomma to create a new piano standard based on German precision craftsmanship and current international developments in the science of acoustics and music technology. 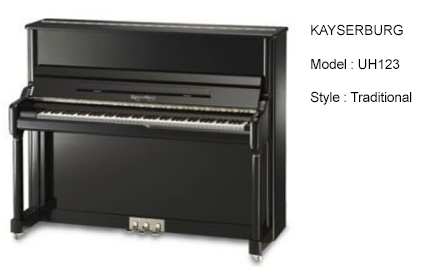 The entire line of Kayserburg pianos exhibits an exceptional performance standard resulting from the intensive experiments and research by Mr. Thomma and his outstanding team at Pearl River Piano Group, who continue their quest for excellence and innovation by using a combination of world tradition and state-of-the-art computerised manufacturing techniques.